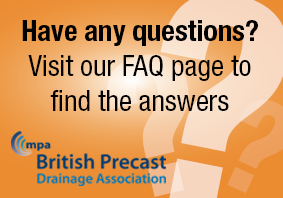 We are delighted to announce the formation of the British Precast Drainage Association (BPDA). This new association is formed from the integration of the Concrete Pipeline Systems Association (CPSA) and the Box Culvert Association (BCA) and takes its place as one of the specialist groups within the British Precast Concrete Federation to represent the interests of the precast concrete drainage industry as a whole. The new Association draws on the expertise and heritage of its two constituent groups: while the two product types have distinct characteristics, there is much common ground in the use of concrete products in drainage applications. Bringing the two associations together allows us to combine our resources more efficiently to promote the benefits of precast concrete drainage solutions. The concrete industry has some compelling product benefits to shout about. Our mission is to provide measured and accurate information and to counteract situations where inadequate and misleading opinions prevail. There is no doubt that bringing together these two organisations provides new strength and clarity to our campaigns.